Carla Hall made a bunch of great soup toppers on The Chew, including a Bacon Spiced Popcorn recipe, a Pasta Chips recipe, and a Pesto Cheese Crostini recipe. Check out my attempt to reproduce them below! Crisp bacon in a medium sauce pot on low heat. Once the bacon is done, remove the bacon and add the popcorn kernels to the pot. Cover with lid and let the kernels pop until you don’t hear any more pop. Remove from heat and add to a large mixing bowl. Toss with crispy bacon, chili powder, salt, and pepper. Enjoy! Serve by itself, like Clinton likes, or in squash soup, as Carla recommended. Toast baguette slices slightly on a baking sheet in the oven. Then remove from the oven. 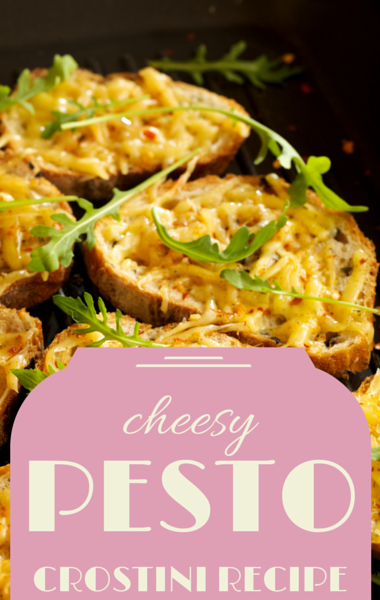 Spread pesto on each baguette slice, with shredded cheese on top. Broil until the cheese has melted. Serve pesto crostini by itself, or in tomato soup, as Carla Hall recommended. Fill Dutch oven with 3 inches of oil and heat it to at least 375 degrees. Add the leftover pasta and cook it for 1 to 2 minutes until it floats and is a nice golden color. Remove it to a paper towel lined plate. Beware of wearing silk while cooking this. Carla did for some reason and Mario took over so she could keep her silk shirt nice. You want the spice mixture to match the flavors of your soup. In this case, Carla recommended Chicken Vegetable Soup, so she suggested the thyme, salt, and pepper. But you can use whatever spices are in your soup. Mix them together and toss the pasta in them. Serve as a topper for your soup and enjoy!